Mother Goose is soaked in history: it was once a city castle and was later taken over by squatters before it was turned into a hotel. It’s anything but a traditional hotel experience. We welcome you under our wings! During the transformation we have made sure to respect the history of the property. Mother Goose offers a total of 23 rooms with a story, spread across 4 different colour-themed floors. In collaboration with Morph Design we have translated our story into a design that meets the needs and wants of our guests. We've paid attention to what is most important: a fantastic bed in beautiful surroundings. The design of Mother Goose is absolute eye candy with a home-away-from-home vibe. Each of our rooms has its very own character and unique design, spread across 4 floors which all have their own colour theme: white, grey, brown and black. 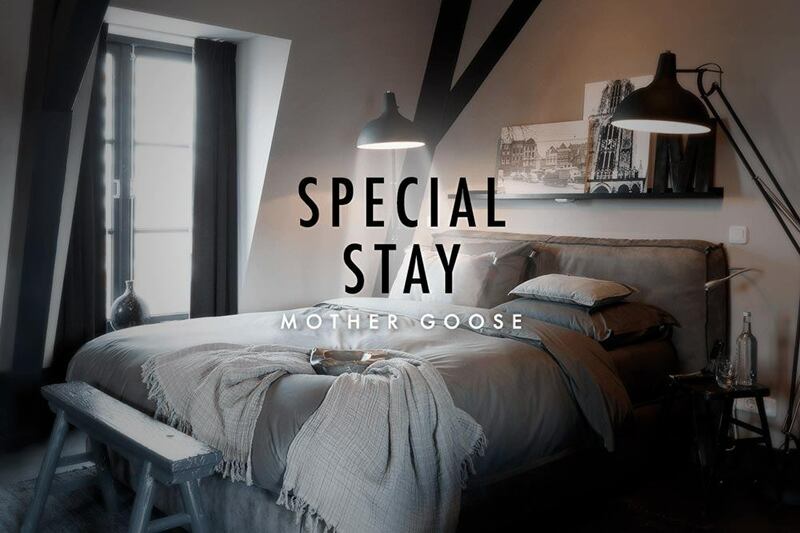 Mother Goose is a favourite to many bloggers and vloggers, and our rooms are often used for photoshoots. All of our rooms are unique. Every floor offers different room types: small, medium, large and suite. Send us an email if you've absolutely fallen in love with one of them, and we'll do our very best so that you can stay in your favourite room. This cosy 16 m2 nest is equipped with all the comforts you need for your stay. These rooms are full of character with old-style elements, ideal for a romantic getaway or business traveller. We love a good night's sleep as much as you do therefore our beds are carefully selected. All rooms are suitable for double occupancy. Due to safety measures, it is not possible to place an extra bed in the rooms. At a spacious 19 m2 to 22 m2, these rooms are perfect for those who value that extra bit of space. All uniquely designed with their very own identity. Equipped with all the comforts you’ll need for your stay. We love a good night's sleep as much as you do therefore our beds are carefully selected. The Large Mother Goose is super spacious at 21 m2 to 25 m2. Great for those who decide to stay a little longer or simply enjoy more space. Are you travelling with your little goose? These rooms allow us to place a baby cot at no extra charge. Again, uniquely designed rooms and full of characteristic old-style elements such as the medieval walls. Some of these rooms come with the great city view. We love a good night's sleep as much as you do therefore our beds are carefully selected. * Book two Large Mother Goose Rooms next to each other with a connecting door, perfect for families. Don't fancy sharing your bed? This room type allows us to create two separate beds upon request. Note: only upon request! All rooms are suitable for double occupancy. Travelling with a little goose? We happily place a baby cot at no extra charge in our Large Mother Goose Rooms. These rooms are without a doubt our favourite, and are spread across our various colour themed floors. At 25 m2 to 30 m2 our suites offer all the space you could wish for and more! The ultimate Mother Goose experience. We love a good night's sleep as much as you do therefore our beds are carefully selected. All rooms are suitable for double occupancy. All rooms are suitable for double occupancy. Travelling with a little goose? We happily place a baby cot at no extra charge in our Large Mother Goose Rooms. Mother Goose is soaked in history and everything but a traditional hotel experience. We welcome you under our wings!